Chronic social isolation has debilitating effects on mental health in mammals—for example, it is often associated with depression and post-traumatic stress disorder in humans. 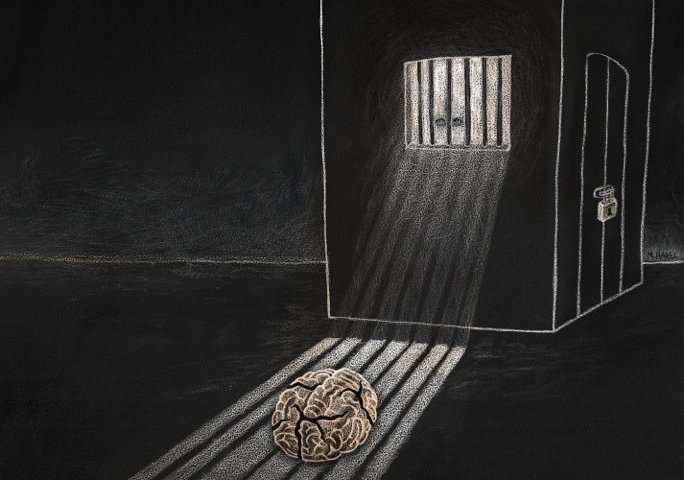 Now, a team of Caltech researchers has discovered that social isolation causes the build-up of a particular chemical in the brain, and that blocking this chemical eliminates the negative effects of isolation. The work has potential applications for treating mental health disorders in humans. The work, led by postdoctoral scholar Moriel Zelikowsky, was done in the laboratory of David J. Anderson, Seymour Benzer Professor of Biology, Tianqiao and Chrissy Chen Leadership Chair, Howard Hughes Medical Institute Investigator, and director of the Tianqiao and Chrissy Chen Institute for Neuroscience. A paper describing the research appears in the May 17 issue of the journal Cell. Confirming and extending previous observations, the researchers showed that prolonged social isolation leads to a broad array of behavioral changes in mice. These include increased aggressiveness towards unfamiliar mice, persistent fear, and hypersensitivity to threatening stimuli. For example, when encountering a threatening stimulus, mice that have been socially isolated remain frozen in place long after the threat has passed, whereas normal mice stop freezing soon after the threat is removed. These effects are seen when mice are subjected to two weeks of social isolation, but not to short-term social isolation—24 hours—suggesting that the observed changes in aggression and fear responses require chronic isolation. In a previous study of the Drosophila fly, the Anderson laboratory had discovered that a particular neurochemical called tachykinin plays a role in promoting aggression in socially isolated flies. Tachykinin is a neuropeptide, a short protein molecule that is released from certain neurons when they are activated. Neuropeptides bind to specific receptors on other neurons, altering their physiological properties and thereby influencing neural circuit function. To investigate whether the role of tachykinin in controlling social isolation-induced aggression might be evolutionarily conserved from insects to mammals, Anderson's team turned to laboratory mice. In mice, the tachykinin gene Tac2 encodes a neuropeptide called neurokinin B (NkB). Tac2/NkB is produced by neurons in specific regions of the mouse brain such as the amygdala and hypothalamus, which are involved in emotional and social behavior. The researchers found that chronic isolation leads to an increase in Tac2 gene expression and the production of NkB throughout the brain. However, administration of a drug that chemically blocks NkB-specific receptors enabled the stressed mice to behave normally, eliminating the negative effects of social isolation. Conversely, artificially increasing Tac2 levels and activating the corresponding neurons in normal, unstressed animals led them to behave like the stressed, isolated animals. "Humans have an analogous Tac2 signaling system, implying possible clinical translations of this work," says Zelikowsky. "When looking at the treatment of mental health disorders, we traditionally focus on targeting broad neurotransmitter systems like serotonin and dopamine that circulate widely throughout the brain. Manipulating these systems broadly can lead to unwanted side effects. So, being able to precisely and locally modify a neuropeptide like Tac2 is a promising approach to mental health treatments." It's not often that two articles in the same marquee seem to have significant connections to each other. Phys Org has one article claiming video gaming can create new types of neurons and this article says that prevention of socialization can affect the nature of the brain in a host of areas. The question can be raised does obsessive video gaming constitute a form of social isolation? Even if there are people on the screen, there isn't necessarily socialization! Consider the huge number of violent crimes, these days, many by young people with, basically, not necessarily entirely formed minds and brains. The article, for example, mentions "hyper sensitivity to threatening stimuli". The article only mentions mice staying frozen long after a threat is gone. Treated a way they don't like, young people may be temporarily frozen, but then lash out with means suggested by the video games. How I lash out is governed by events happening to and around me as a very young child. Video games never had the emotional impact of personal violence given or received from family and neighbors. "...does obsessive video gaming constitute a form of social isolation?" can be investigated further now with the benchmark chemical marker for isolation. That answer could change attitudes at many levels. We take no responsibility for our decisions.